Perhaps the most useful change is that EKP now shows the full titles and IDs of several of the courses in the package on the import options screen right after you select the package and the character encoding. 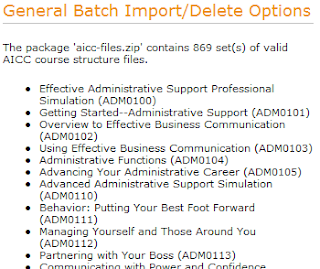 That lets you see what courses are available in the package before running the import. It's also helpful if you're not sure what character encoding to use, since you can check that the course titles look correct before running the import, and if not you can return to the previous step and choose a different encoding. EKP also now shows full course titles in addition to IDs on the summary page once the bulk import is complete. We've also simplified the process in the case where the package contains only a single set of course structure files. In this case, the process is almost identical to importing a SCORM content package, and EKP will provide a detailed error report if it finds any problems with the files. These changes will be available in versions 4.6.0.83 and 4.5.1.197.